Munich - The votes are in and they are yet another proof that is fully committed to Borussia Dortmund's cause right to the very end of his time with the Schwarz-Gelben. The FC Bayern München-bound Polish forward, inspirational once again for the Westphalians at the weekend, was the standout winner of bundesliga.com’s Matchday 31 Player of the Week vote. Lewandowski scored one and earned a penalty in Dortmund's 4-2 victory over 1. FSV Mainz to help BVB secure their place in next season’s UEFA Champions League, and take 47 per cent of the votes. 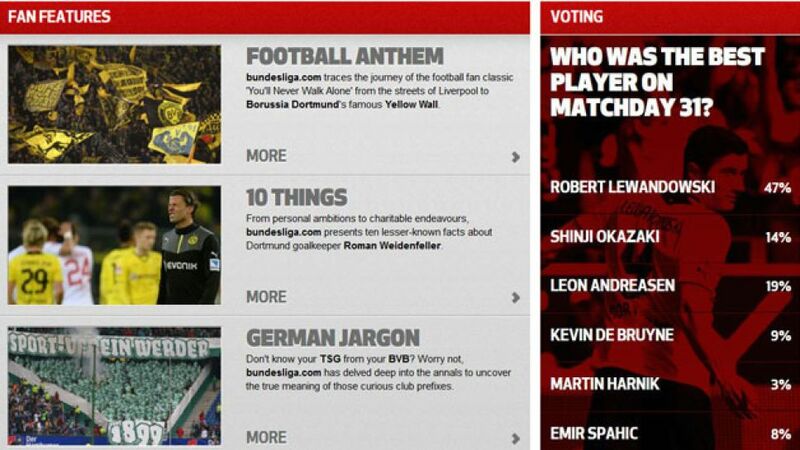 was another player on the field at the Signal Iduna Park, Okazaki’s fifth brace of the campaign earning him 14 per cent of the poll and third place in the vote. The 28-year-old attacker is now on 13 strikes this season, making him the joint-most prolific Japanese player in a single season, on par with former Dortmund midfielder Shinji Kagawa. Second place, meanwhile, went to Hannover 96's , who provided the opening goal in his side's 3-2 win over Eintracht Frankfurt on Friday night. As if that was not enough, the midfielder threaded through a sublime pass to Didier Ya Konan for the Reds' third in a result which puts some daylight between the Lower Saxony side and the relegation zone. Kevin De Bruyne, influential again as VfL Wolfsburg kept up the pressure on fourth-place Bayer 04 Leverkusen, took nine per cent following his first goal for the club, while Emir Spahic, who was on target twice for Leverkusen on Sunday, got just one per cent less in fifth. Finally, Martin Harnik's brace for Stuttgart earned him three per cent of the total votes cast.